I enjoyed our time on the Brooklyn Hike! Hope to walk with you again!" 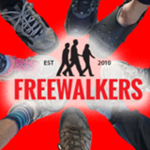 Welcome to FreeWalkers (officially). Guess you made it back home from Saturday!